Our history dates back to 1889 when the Cheyne Hospital, Cheyne Walk in London was opened and was known as The Little Hospital by the River. 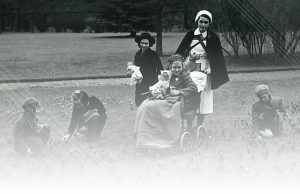 Care was provided for disabled children, although cerebral palsy wasn’t identified until after WW11. Initially privately funded, residential,daycare and services were provided for children with cerebral palsy. This became known as The Cheyne Centre and was taken over by the NHS. With the support of “The Friends” the centre developed an international reputation for research and innovative practice in the field of cerebral palsy and providing essential funding for staff and equipment. The Cheyne Charity now concentrates on providing practical help and support to children and young adults with cerebral palsy.